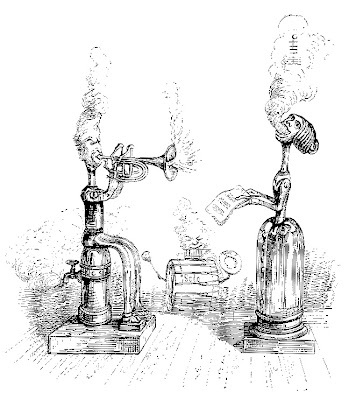 This is a Grandville caricature of music making in the 19th century, but it's probably even more applicable today. The triumph of steamed powered mechanical music isn't very different from the over-produced, over-engineered stuff we are getting now. And they retain about equal levels of authenticity. With all the current sequencers, sound software, looping, etc., engineering has supplanted music by voices and live instruments to provide that all pervasive wallpaper of sound we're bombarded with today. Obviously, there is validity to work based on sampling and collage (e.g., artists like D J Spooky have created beautiful and provocative sound pieces). Without sampling technology, much of current music couldn't even exist, but so much of the stuff we do hear is techno hackwork. I've received a few inquiries as to how we made (apparently) three dimensional objects appear and disappear on stage. Given my aversion to (and the expense of) cutting edge technology, we used a much simpler 19th century stage illusion known as "Pepper's Ghost." This involves lighting and reflections off a sheet of angled glass (or in this case, acrylic), much like seeing your own reflection in a window while riding in a train or car. The largest modern use that I know of is at the Disney parks in the Haunted Mansion variants. The ballroom dancing ghosts aren't, as popularly believed, to be holograms; they are lit reflections of hidden animatronic dancers off a gigantic piece of sheet glass. There are several good descriptions of the illusion on the net (especially in articles on building Halloween haunted houses), but the most thorough explanation and history is in Jim Steinmeyer's book, Two Lectures on Theatrical Illusion, Hahne, 2001.